Thanks for this very well done app. As a catholic I am so glad to have both the RSV CE and the DR versewise editons. They function flawlessly. Kudoes on the indexes, footnotes and intros, great setting options, and terrific search function. I wish all my apps were as well conceived as this one! Fantastic resource for "on the go"
This product is an invaluable asset to have on your person at all times. The search feature is a great tool that gives clear and concise info. A "must have" for any bible studying Catholic. Any chance that this firm can make the CCC and Navarre Bible available as well? My only suggestion is that the titles at the top of the screen that say "Old Testament" or "New Testament" would say, example, "OT Exodus" "NT Acts" so that you don't have to scroll to the top to remind yourself which book you are in. Over the past year I have emailed the developer, notifying him of bugginess in the functionality of the highlighter feature. He’s responded saying he’d fix it in the next update. However, after more than a year, after a recent update the highlights still don’t work properly. (They disappear when moving to the next chapter.) Overall this is a well-conceived Bible app. It’s a great translation, and the design and functionality, especially regarding the organizing and tagging of bookmarks, is just great. However, this has made developers inability or unwillingness to fix bugs that much more disappointing. I hope they can polish this app for future releases. The best there is for Catholics! Thank you for putting the RSV CE version up!!! It's worth the money just to get the WHOLE Bible on my iPhone! 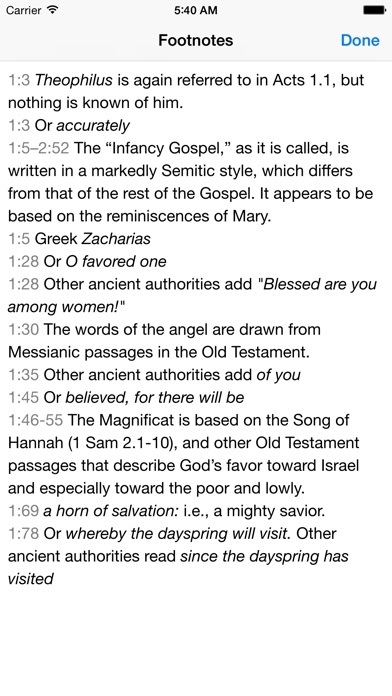 Other versions exclude books and insert their own language like "backsliding" into the Bible. This is excellent. The best Catholic Bible for serious study! Incredible! I did not expect to find my #1 translation so soon after purchasing my iphone. The RSV-CE is the recommended translation for serious study, and to have it at my fingertips like this is amazing. 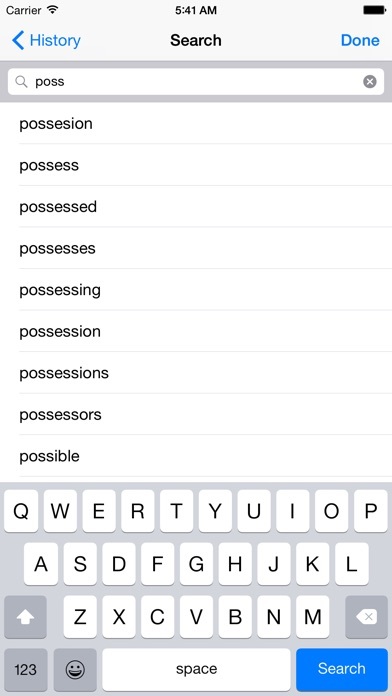 Highly recommended for the serious Catholic's iphone app collection!! I wish there was an iPad version, this version is just too blurry when on the ipad. With Ver 3, it is my main Bible app now! I have been using this Bible & the Olive Tree free Douay Rheims interchangeably. I had to use Olive Tree because Versewise didn't have bookmarking ability in previous versions. I have given feedback to Versewise since version 1 and now finally version 3 has bookmarking & tags! It is now my complete Bible App! Thanks to Versewise! Awesome app, I use it every day. I would love to see a Jerusalem Bible or New Jerusalem Bible in the same format! This is the best Bible app I've found. The highlighting feature and ability to email makes this a must have! I wish I had spent the extra few dollars sooner as it is well worth it. My Favorite Translation now in portable form! Would love to see RSV 2nd CE Needs new icon, this one feels very dated. This is truly a well designed Bible app. I took some time to research a good Catholic Bible and came upon a recommendation made by a respected convert to the Catholic Church. What a great tool to draw us closer to Christ! Thanks to Taylor Marshall.. God Bless You! I love it Since I have it on my I pod I don't stop Reading. Thank you. This is a great app but it would be helpful if you had a way to take notes. Excellent so far. I love the different versions especially The Message. Great product for Orthodox Christians as well! Thank you, VDUB, for this first-rate app. In addition to the New Testament, it contains the entire Old Testament as used by Catholics and Orthodox without later Protestant editing. It also uses the highly scholarly and highly literary RSV translation, which retains much of the beauty and tradition of the KJV (AV) while leaving aside difficult archaisms. The interface is beautiful, the features useful, the overall experience pleasant and edifying. If I could give it NONE I would. There are whole scriptures missing!!! It's disgusting to pick apart the Holy Scriptures!!! Why was this dropped from the Ipad.? I'm speechless! All I can say is, the RS-CE was well worth the wait. Thanks! Great Resource for your spiritual life. Great resource, especially when traveling. Has many helpful tools and features. The support team is very responsive to fixing bugs when brought to their attention. 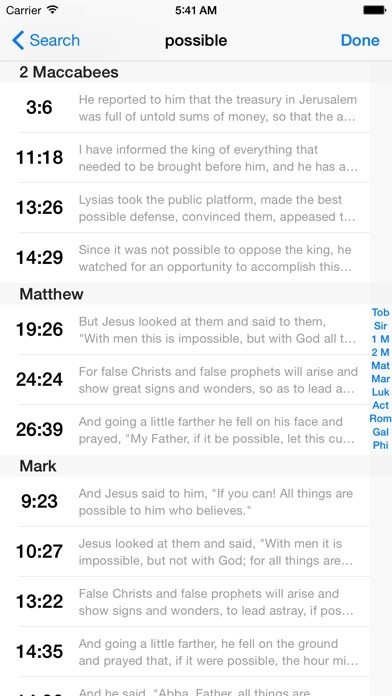 Highlight, bookmarking & tagging of verses let's you organize scriptures easily. Looking forward to more reading plans. This is a well-done app. Easy to use and easy to read. The notes are very helpful and the RSV is my favorite translation. Thanks for putting another Catholic Bible in the app store! Great app, but would live to see the daily Mass readings offered in RSV - a la Universalis. This is the best Catholic Bible app for contemporary usage. Even though the USCCB encourages use of the NAB translation, the Catholic lectionary relies upon the RSV-CE and this is the true translation that is used worldwide at Mass. I use this app daily, both in my work at the local parish and personally. VerseWise is the best bible app out there. You can see the great care taken by this developer to get thing right. Easy to navigate, easy to use. Best of all, this developer is very responsive. As to the commenter who has display problems, you should contact the developer. Personally, I have had no such issues and have used this app every day since it first came out. Very helpful app. I love it! The search is great, makes a great traveling tool, unobtrusive so that one is not being overly showy, but can still be available for use. It is a great tool. I've been patiently waiting for the RSV-CE for months now. It's finally arrived and thankfully it's moderately prices. For all my fellow Catholics out there, let it be known that the App store is really a gold mine. So far the I've found the Complete Catechism, The Breviary with daily Mass Readings, the Rosary, now the RSV-CE. Someone please make an app with the Church Fathers and Councils. 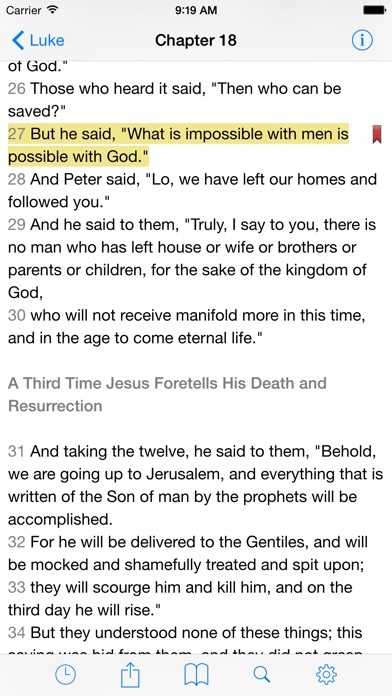 I love this app for putting the Bible right at my fingertips. I like that I can copy a passage and email it to myself or someone else. The layout is great. I got this app for use with my iPhone and now I use it with my iPad, but I am eagerly waiting for the iPad version. The description says we can copy verses to clipboard but I'm not able to. How do I go about doing that? A good thing to add would be a "Notes" section, where we can add copied and/or highlighted verses and type in notes about them. If this app had all the features of my NABre Bible App by Just1Word, Inc but kept the beautiful layout of this app, it'd be perfect. Also, I wish this developer would come out with either a New American Bible (NAB) or New American Bible, Revised Edition (NABre) app. They make the most beautiful bible apps and an NAB and/or NABre bible app(s) would be so awesome. This app is PERFECT for Catholics who want to have the Bible at their fingertips wherever they go. The Revised Standard Version-Catholic Edition (RSV-CE) of the Bible is the best Catholic translation in my opinion, and I was pleasantly surprised to find an app for it. This app makes it simple to read the Bible anytime. I can find any Bible book and verse I'm looking for with just a few movements of my finger. And it is completely accurate, right down to the commas and periods. Some other nice features: you can adjust the text to whatever size is comfortable for you to read, and you can bookmark verses that you want to be able to find again easily. Beautiful app. Worth every penny! I'm now using this app in a Bible study class I'm teaching. It's makes finding anything easy and quick. Plus the RSV-CE is a great translation. Thank you. Its great to have a Catholic product that is not just an inferior after thought knock off of a protestant equivalent. High Quality. If you put out an NAB with study notes, I will purchase it as well. Continued success. I heard about this app from a friend and I loved it! It is easy to use and read. Very much a fan — 5 stars if improved. Needs to have some function to hide the upper and lower menu bars. A double tap, perhaps? I don't want to be always conscious that I'm reading on an iPhone... distracting, first, but also takes valuable screen space. Other readers have done this successfully. This is a marvelous resource. It is easy to use, looks great and puts the very best and most accurate English translation literally at my fingertips. I use it daily to replace the often silly ICEL translation used in the Liturgy of the Hours (which, thanks be to God, is in the process of being revised in the same style as the new translation of the Roman Missal). The features are easy to learn, highly intuitive and quite useful. I also use it for study and contemplation, and the ability to go right back to where you last were reading in any book is most helpful. Highly recommended! Great app. I use it everyday. Ease of use is fantastic. I can grab passages and copy into my wp app for exegetical purposes or drop a passage into my class notes as the professor mentions it. I've been using the app for neatly two years and still love it. Excellent job all around! Thank you, thank you, thank you!!! A great app! I hope that you can make an iPad version. 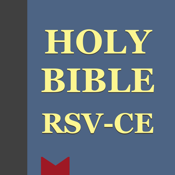 This is a great bible reading App and the RSV-CE is a good translation. But the RSV-CE2 (Second Catholic Edition) is better. Could you look into making it available too? Also, could you add some catholic commentaries like Lapide, Haydock, Catena Aurea, Navarre bible Notes, Ignatius Study Bible notes, etc? Great app. Unlike the free Gutenberg version, via Stanza, this app has all the books and chapters labeled. Great number of features. 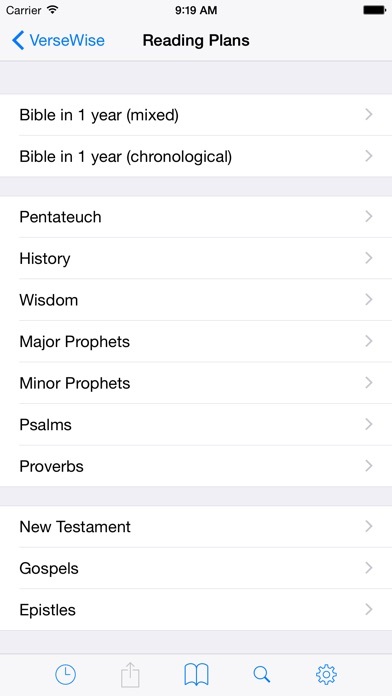 Nice to have an iPhone Bible that has all the books of the Old Testament recognized by the Church.